All students will have basic desk chairs in their dorm rooms whether or not they choose to purchase a fire-code rated upholstered desk chair (the fire-code rating applies to upholstered furniture only). 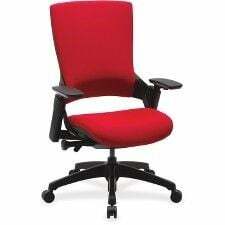 Upholstered desk chairs brought in to replace the basic desk chairs, supplied as standard room furnishings, must be labeled as compliant with CA 117. Chairs not appropriately labeled will be removed. 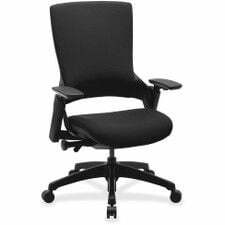 To make it easier for students to comply with Deerfield’s fire code, we have arranged an opportunity to purchase CA 117 fire-code rated desk chairs through Hitchcock House. 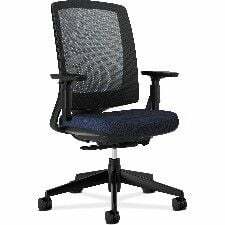 In conjunction with a local office supply store, we are able to offer these chairs at a savings of up to 25% off regular list prices and have them delivered to Deerfield Academy. Chairs can be ordered in the summer for delivery to campus at the start of school. To have your chair available when you arrive on campus, we must receive your paid order by August 10. Upholstered chairs may not be available for order during the school year. All chairs carry a limited manufacturer’s warranty. 6.25% MA state sales tax must be added to the total order, but no additional shipping or delivery fee is required. Students will receive an email when chairs have arrived, with information on where they may be picked up. In addition, we carry Bungee Chairs in Hitchcock House. By all accounts these are remarkably comfortable chairs and, because they are not upholstered, they are within the requirements of the fire code regulations. A limited supply is available. Or you can place your order Online. Checks and credit cards (MC, VS, AMEX) are acceptable for payment. Student IDs and accounts may not be used during the summer months. Black Frame – 5-star base with dual-wheel hard casters for easy mobility. 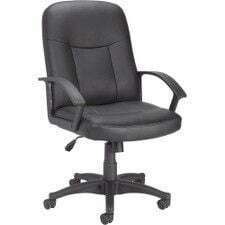 Fully upholstered with bonded leather; 3″ thick cushioned back for comfort. 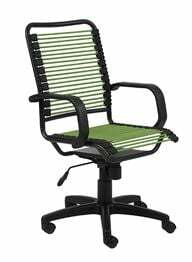 Pneumatic seat-height adjustment, 360-degree swivel, tilt, tilt tension and tilt lock. Fixed open loop arms. 275 lb. capacity. California 1117 Rated/Fire Coded. The Bungee High Back Office Chair combines unique style with great support to help create a more comfortable workspace. This swivel office chair features extra strong bungee cord loops that provide unique comfort and support for the seat and back, rolling casters for smooth mobility, and is fully adjustable to accommodate your size and posture.